This unique and comprehensive guide revolutionizes the way Chinese medicine is used and taught in the twenty-first century. Such an ancient system might seem outdated for contemporary life, but this book reveals how it's actually perfect for modern concerns—everything from stress caused by social media to round-the-clock access to rich and fatty food to anxiety over endless checklists and responsibilities. Chinese Medicine for the Modern World discusses six common syndromes with a focus on the three internal problems of liver qi stagnation, heart heat, and spleen damp. To heal these syndromes, author E Douglas Kihn offers practical strategies and specific directions for substituting unhealthy habits with healthy ones. Discover the Five Elements, the Eight Principles, and the twelve primary channels. Explore hands-on exercises, chapter study questions, clarifying images, and more. 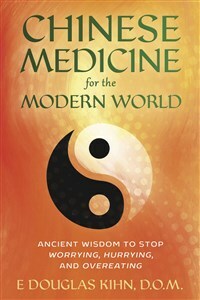 This exceptional book helps you understand and utilize the amazing possibilities of Chinese medicine for current times. The publication of Chinese Medicine for the Modern World will help to accomplish three goals: The popularization of the language and theory of Chinese medicine everywhere, so that Chinese medical theory replaces or at least co-exists with emergency/bio-medical theory in people's minds; a thorough reorganization of the field of healthcare in which preventative and holistic disciplines replace medical doctors in cases other than emergencies; and a comprehensive reform of the teaching and practice of Chinese medicine itself, adapting this ancient medical wisdom to the unique health problems of our modern world. E Douglas Kihn is a Doctor of Oriental Medicine and a wellness coach with over three decades of experience teaching and practicing Chinese medicine. He is the author of BodyTrust, Avoiding Death Indefinitely, and The Workbook of Chinese Herbs, and the producer of BodyTrust Weekly and BodyTrust Mornings on YouTube. Dr. Kihn lives and works in Los Angeles, California.